A football simulator that combines match simulation with the ability to lead your team as a manager. The game develops ideas known from the popular title New Star Soccer. The creator of the title is New Star Games studio. New Star Soccer Manager is a football simulator, in which we can both play games and lead a team as a manager. New Star Games, the authors of the extremely popular New Star Soccer (New Star Soccer Manager is a kind of development of the concept of that title, but it is not its direct continuation) is responsible for creating this production. New Star Soccer Manager consists of two basic elements. The first one is acting as a manager, within which we deal with the selection of tactics, selection of players, taking care of their health and fitness, as well as financial management, looking for sponsors or supervising the presence of their team in social media. The second part of the game are the games themselves, during which we control the players. The pitch is observed from above, from the bird's eye view (the so-called top-down perspective). The matches are highly arcade and resemble a bit of classic football games like Sensible Soccer - however, they do not lack some tactical depth, which makes them more realistic than those known from New Star Soccer. Some of the elements of the game are based on a system of cards, which we can accumulate both by playing and spending money within the micropayment system. 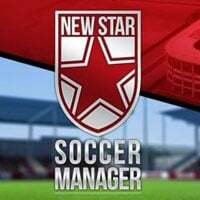 New Star Soccer Manager has a single player mode only. New Star Soccer Manager has a two-dimensional graphic design. Graphics will rather not delight anyone - there is no need to look for spectacularity and graphical waterworks. However, it is undoubtedly legible and works well in this production.